“Sometimes, or most of the times, teenagers tend to hate any task given to them, whether homework or house chores like cleaning up or washing the dishes. I myself hate having to do anything like such, and most of the time I would have to do it by force. It really feels bad to have to do something by force because then you would do it in a wrong way or mess up and get nothing done. I came across a quote that said “Do what you love to love what you do “. At first I thought it was related to what job I’d end up with in the future, or something like that. After thinking deeply about it, I realized that there was something I could do that would help me very much when doing anything, even chores! I thought that, what if I try to think of something to make me do whatever it is that I’m doing with love ? Maybe while washing the dishes, I could imagine how happy my mom would be or even how clean the sink would look like once I’m done? Or while cleaning my room, I could think how clean it would be after I’m done, then maybe I can light some candles, sit back and relax !? I’ll be really good to just try to imagine myself mastering a piece of art, and once I’m done, take a step back and admire the work done with love! I personally like to think how good the thing I’m doing will be after I’m done, and that is what makes my chores bearable! 13 year old Egyptian Farida Al Sayed is an amazingly determined, passionate and ambitious young lady who keeps raising the bar for herself. Farida always reflects on matters of Life, inspired by great people around her, namely her grandmother. Farida says that people who inspire her in a lot of ways are those who are passionate about who they are and what they do; those who make even the simplest task they do seem lovely! It’s really nice to see people like Farida, who are inspired by a lot others around them, are themselves a great source of inspiration for a lot others! Check out the contribution of 13-year-old Korean Jisoo Kim! 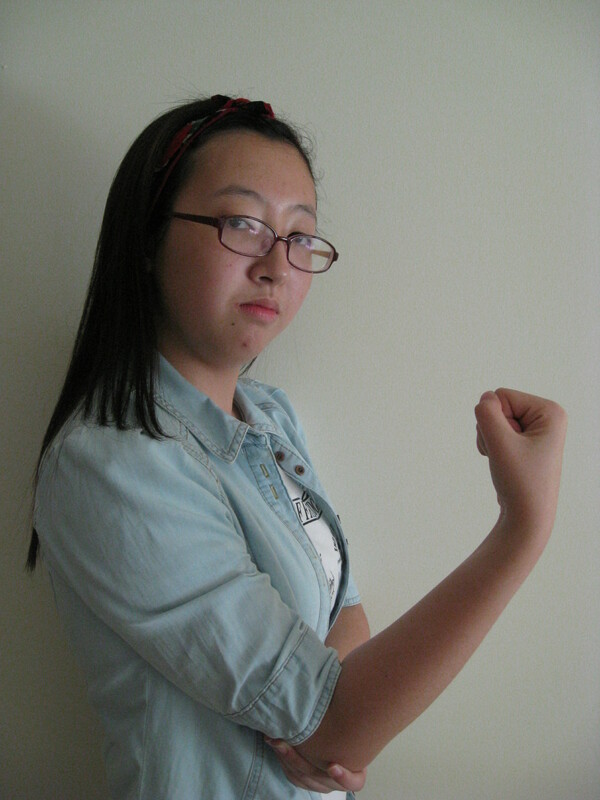 With whatever was available for her, she did her best to share with us her own interpretation of “We Can Do It” poster. 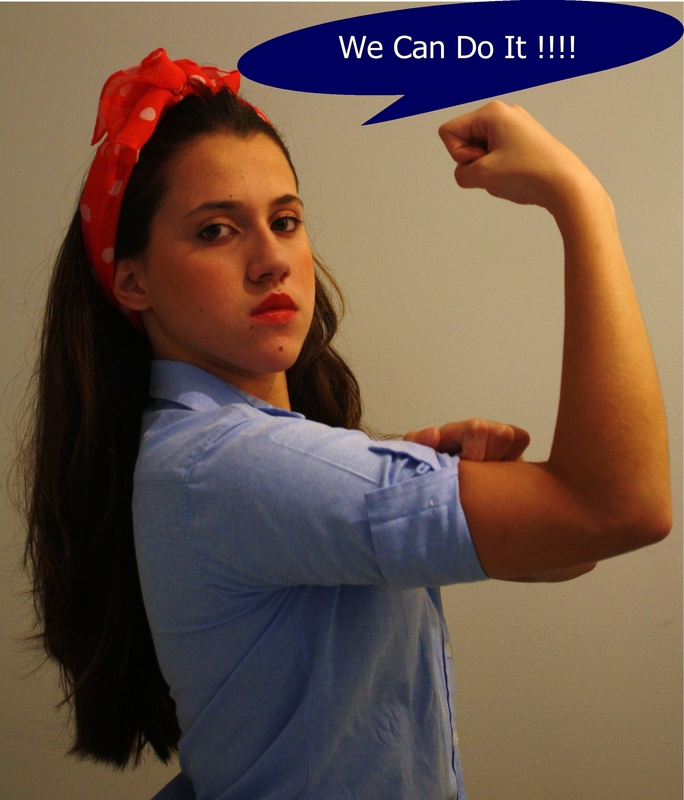 I would like to share with you the first re-creation of “We Can Do It!” poster done by 13-year-old Brazilian Bianca Tonelli. This is a very famous poster of the early 1940’s. 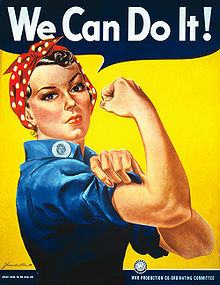 “Rosie the Riveter” is an American cultural icon representing the American women who worked in factories during World War II replacing men who were in the military. It represented the “Can Do” spirit of America. Take a picture of yourself recreating the exact same poster, representing YOUR “Can Do” spirit!! We will try to create a single poster of all your images!